FWT3 Saturday Report – Arseneau Dominates as the Racing Heats Up – CKN | CanadianKartingNews.com | Because Karting is a way of Life! Ramirez, Ramos, Arseneau, Sorensen, and more prove to be the best on a long but important Saturday of racing in Ocala. 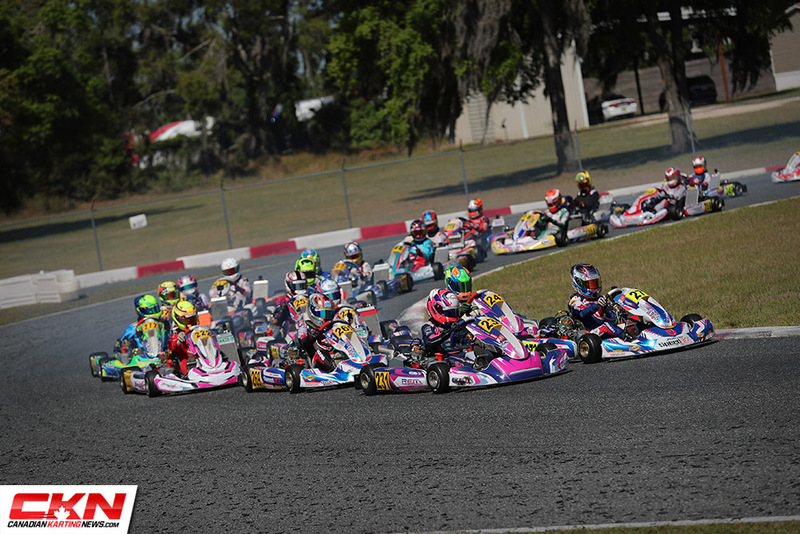 After 20 heat races and 10 pre-finals, it was a demanding day on Saturday at the final round of the 2019 Florida Winter Tour by ROK Cup Promotions as competitors raced into the evening hours. A schedule change made prior to the weekend moved the pre-final events to the tail-end of Saturday in order to make for a shorter and more convenient Sunday for the racers. The weather remained perfect and the addition of the pre-final proved to mix things up a bit as some of the top contenders got shuffled around which should make for an exciting Sunday to come. 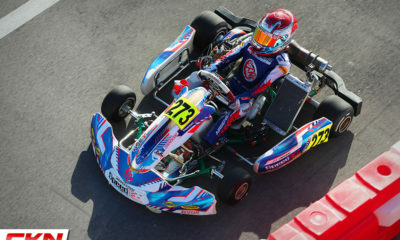 Zachary Hollingshead (TB Kart USA) remained at the point of Shifter ROK after three heat races, with a record of 1-2-1. 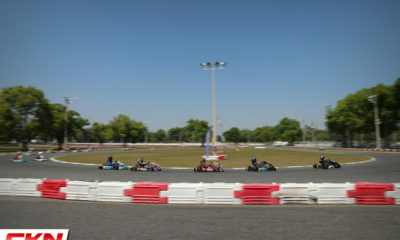 In fact, the entire top four kept their qualifying position through the heats, with Mathias Ramirez (PSL Karting / Birel ART), Jimmy Cabrera (AKT / Kosmic), and AJ Myers (Mad Old Nut / Croc Promotions) all remaining steady. Danny Formal (Leading Edge / Formula K) did move up into the fifth position as he tried to keep pace with Myers in the championship. In the pre-final, Hollingshead had the early advantage, but Ramirez eventually found his way past the local driver and went on to take the win. Myers found some additional speed for the late pre-final, moving up two positions to second. Cabrera maintained his position in third, ahead of a falling Hollingshead in fourth. Rory Van De Steur (Team Felon / Tony Kart) took back three positions to get back to his original qualifying effort of fifth. Formal finished seventh and now has an uphill battle on Sunday if he wants to claim the 2019 championship. 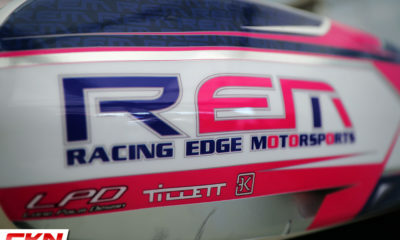 Diego Ramos (HR Motorsport / Kosmic) remained perfect on Saturday and really had no equal all day in Senior ROK. 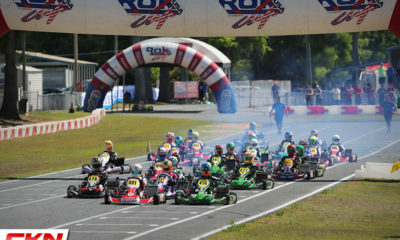 The Brazilian has shown the 26-kart category the way around the OGP circuit in dominating fashion heading into Sunday. Eduardo Barrichello (Orsolon Racing / Tony Kart) made it through the heats with a 4-2-2 record to start on the outside pole position for the pre-final, but suffered a mechanical failure in the first turn of the race, dropping him to the tail of the field. Christian Brooks (Orsolon Racing / Tony Kart), Arthur Leist (PSL Karting / Birel ART), and Nicholas Hornbostel (REM / Kosmic) have been racing hard this weekend with Brooks getting the edge through the heats over Leist and Hornbostel. However, Brooks would slide to fifth in the pre-final, bumping up Leist to second and Hornbostel to third. Axel Cabrera (AKT / Kosmic) made entered his name into the top four for the first time this weekend as we head into Sunday. 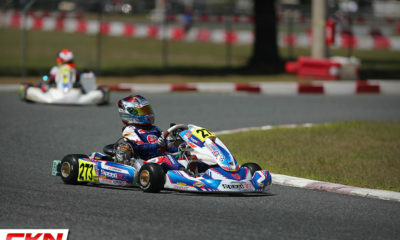 Justin Arseneau (Speed Concepts / Tony Kart) too remained perfect through the heats on his Tony Kart in Junior ROK. The Canadian has made it look easy out front while behind him has been a flurry of activity. Joey Atanasio (REM / Tony Kart) moved up one spot from qualifying to take second into the pre-final. Championship leader, Luca Mars (Speed Concepts / Tony Kart), also moved up from qualifying to place himself inside the second row. Rookie driver, Jeremy Fletcher (Zanella Racing / OTK), has run strong with the more experienced Juniors up front, placing fourth ahead of the return of Connor Zilisch (Team Felon / Tony Kart) in fifth. In the pre-final, Arseneau again held a comfortable margin out front for the entire 18-lap race to take the win. Enrico De Lucca (NF Sport/ Kosmic) charged nine spots up to the second position ahead of Zilisch, who has had a slow but steady climb to the front. Alessandro De Tullio (AM Racing / Exprit) had his best run of the weekend, advancing 17 positions to take fourth. 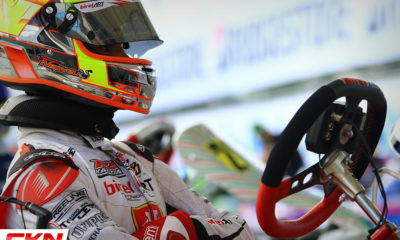 Top driver from the first two rounds, Diego Contecha (Orsolon Racing / Tony Kart), finished fifth. Luca Mars got the wrong end of a few battles on the track that dropped him to 11th. With De Lucca finishing second, the fight for the championship got much closer and Sunday’s results will be very important for these two. 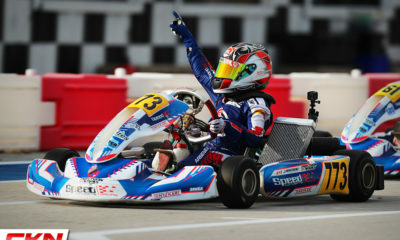 Kai Sorensen (Supertune USA / Tony Kart) has come in and taken command of the weekend and the championship in Mini ROK. The California driver led predominantly in the heats and took care of business in the pre-final by 3.5-seconds. Sorensen’s teammate, Jorge Ortiz, rose two positions in the pre-final to finish just ahead of Caleb Gafarar (PSL Karting / Birel ART). Anderson Leonard (Supertune USA / Tony Kart) will roll out fourth on Sunday after dropping two positions, while Jack Jeffers (Orsolon Racing / Benik) will start from fifth. Jordon Musser (PSL Karting / Birel ART) had made the Shifter ROK Master heat races look fairly easy as he ran a perfect record through the thirty laps. However, a failed start in the pre-final has the Texan set for a gruelling battle on Sunday from the rear of the field. Championship contender, Victor Jimenez (RPG / Kosmic Kart), had his best run of the weekend finishing first in the pre-final, which shortened the gap to Luis Schiavo (Goodwood Karting / Kosmic) in the championship. Schiavo and his teammate, Richard Heistand (Goodwood / Intrepid) ran third and fourth in the pre-final with Heistand getting the better end. Adriano Amaral (CRG) climbed three positions to put himself inside the third row for Sunday. Yet another clinic has been put on by Brazilian-American, Renato Jader-David (Orsolon Racing / Tony Kart) in the Master ROK division. With a perfect record on Saturday, the Orsolon Racing driver has just one more final on Sunday to put a bow on the perfect 2019 Florida Winter Tour season. Much of the top five from heat racing finished in that order in the pre-final, with Bruno Fusaro (NF Sports / OTK), Adrian Donkers (VSR / Tony Kart), and Camillo Rivera (NF Sports / OTK) finishing second, third, and fourth, respectively. Sarkis Yamme (Orsolon Racing / Tony Kart) tied his best run of the weekend in fifth, climbing two positions. Points leader in Micro ROK, Beckham Jacir (JC Karting / Kosmic), kept the momentum going in Saturday, leading the category through the heat races and in the pre-final. It wasn’t easy though, as Karsyn Walters (Supertune USA / Tony Kart) kept the South Floridian honest, trailing by just three-tenths of a second in the 14-lap prefinal. Enzo Vidmontienc (American Parts Motorsports / Benik) has been on the comeback trail since a poor qualifying effort, now sitting in third after a one-position improvement in the pre-final. Kai Johnson (AKT / OTK) has found his way back to the fourth position after a little trouble in the heats, followed by Carson Weinberg who made up seven spots in the pre-final in fifth. Connor Zilisch (Team Felon / Tony Kart) has inched his way forward and appears to have knocked off the rust from his absence due to injury over the past several weeks. The North Carolinian has risen to the top of the charts in the 100cc Junior category, beating Santiago Biagi (AM Engines / Exprit) by 1.5-seconds in the 18-lap pre-final. In a much more important fight, Biagi got the best of Chloe Chambers (MDR / Kosmic) by one position, allowing the Argentinian to retake the championship lead heading into Sunday by the slimmest of margins. Between Biagi and Chambers, whoever finishes ahead of the other will likely be the champion. Gianpaolo Andreasi (Zanella Racing / OTK) and Kyffin Simpson (Speed Concepts / Tony Kart) will roll off Sunday in fourth and fifth. With the championship on the line, Zachary Linsell (MGM) rose to the occasion in the pre-final of L206 Junior, climbing five positions for the win to take the championship lead into Sunday. Dylan Amundsen (DP Racing / MGM) finished second, right where he started and one half second ahead of Jordan Prior (Prime Powerteam / Birel ART). With only nine points separating Linsell and Prior, the Sunday finish will come down to the wire for the championship. Darryl Timmers (Professional Racing / Intrepid) and Vince Scatena (MGM) finalized the top five after pre-final pole sitter Hunter Fox (MGM) dropped five positions to sixth. With two heat race wins, Gianluca Savaglio (360 Motorsport / Exprit) rolled off in first for the 14-lap pre-final. The Canadian went on to take the win narrowly over Granger Perra by .036 and Adam Ali (REM / Kosmic) by .038 in perhaps the best finish of the weekend. Camryn Reed (Team Felon / Ionic Edge) climbed all the way to fourth after starting in ninth, followed by Alexander Searle (Espionage) in fifth.